Dirt Bike Magazine headed down south to one of the most unique tracks on the circuit. 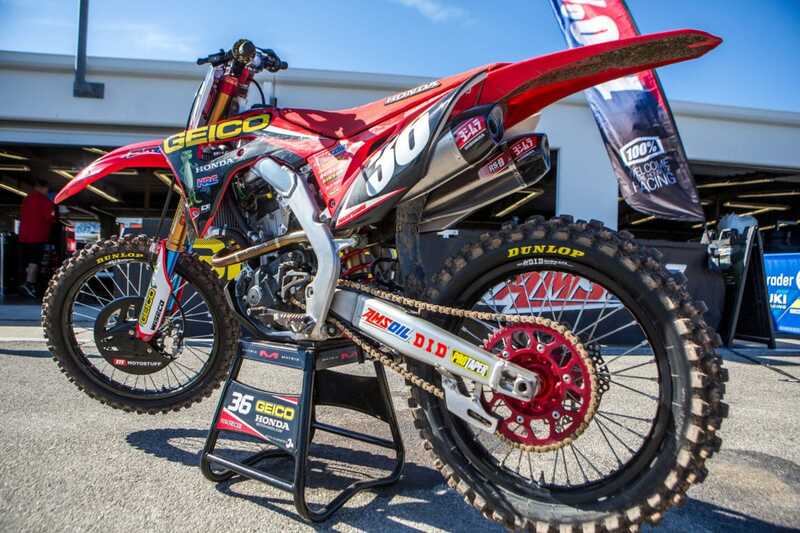 Daytona offers a Supercross race with an outdoor twist. 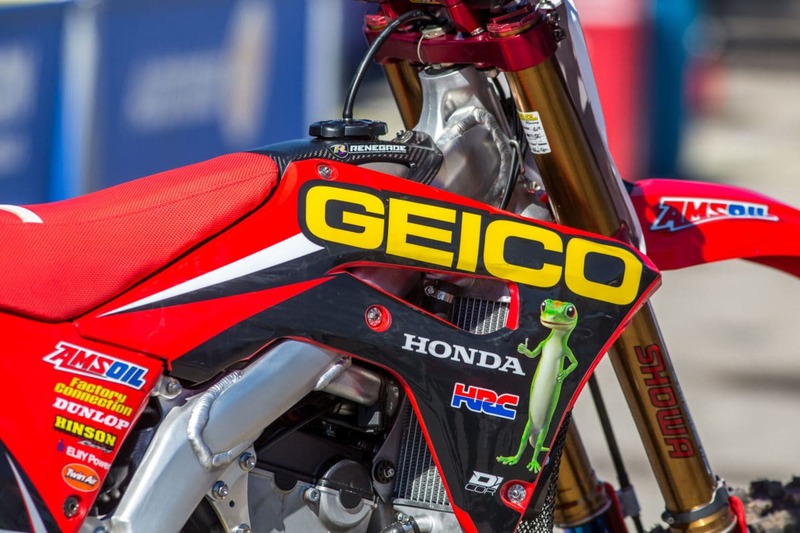 Mechanic Keith Clickstein at Factory Connection/Geico Honda sat down with us and laid out the details on RJ Hampshire’s race machine. 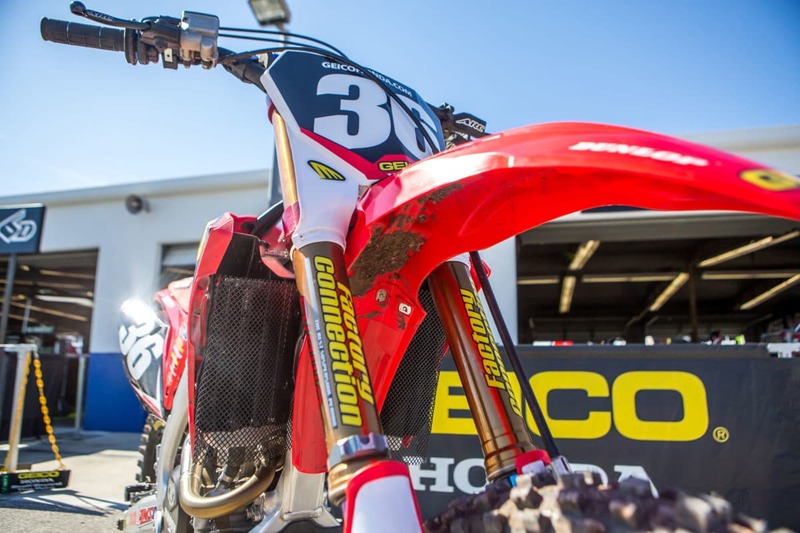 Straight from press day practice to the lenses of Dirt Bike Magazine. 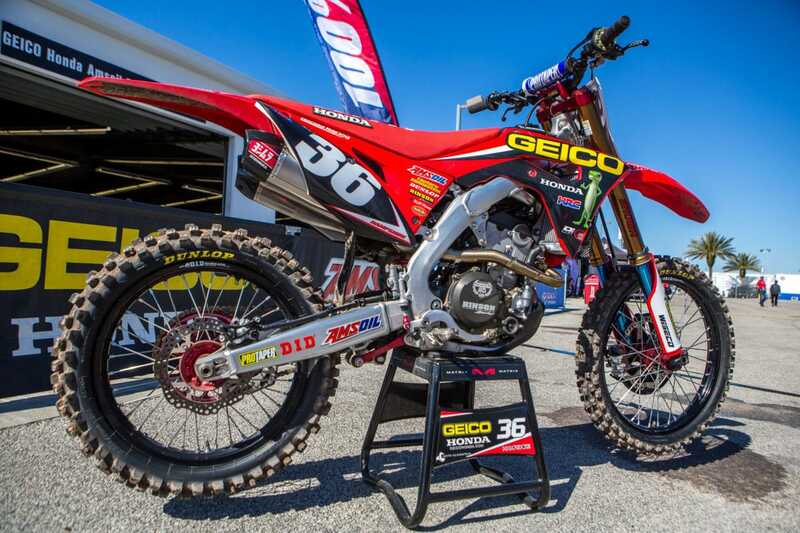 Up top RJ runs a Pro Taper Fusion bar with cross bar with SX race model bend. Holding onto those bars are works mounts and clamps. If you look closely the steering stem nut is fastened with safety wire. 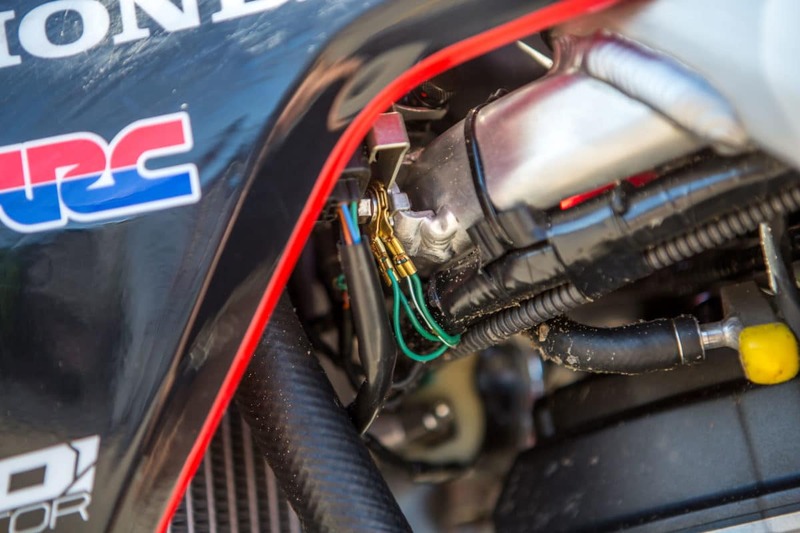 All the race teams add wire like this to the bike in various locations as a preventative measure. RJ runs a fairly loose steering stem. 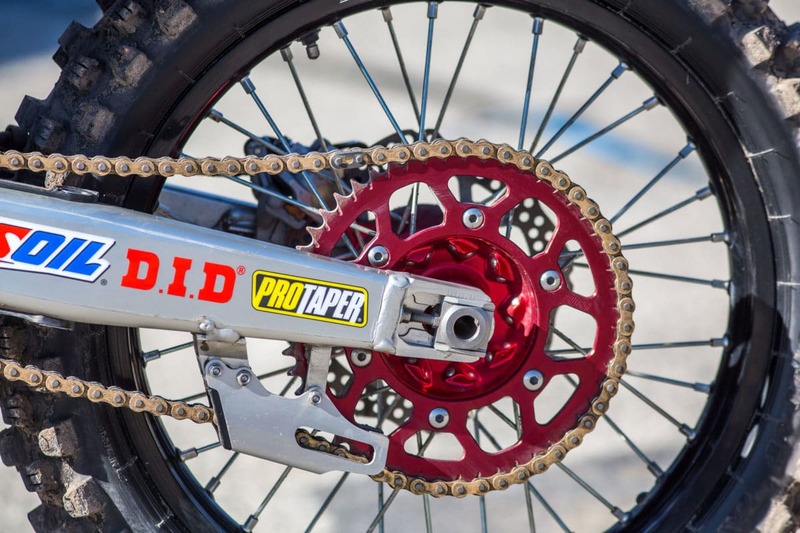 The front brake is powered by a works Nissin caliper and a 270mm front rotor by Motostuff. RJ likes a softer pull on his front brake. He runs a softer front brake lever from ARC and the actual brake pads themselves are chamfered. Chamfered brake pads can reduce vibration in the pad and maximize the surface area on contact. 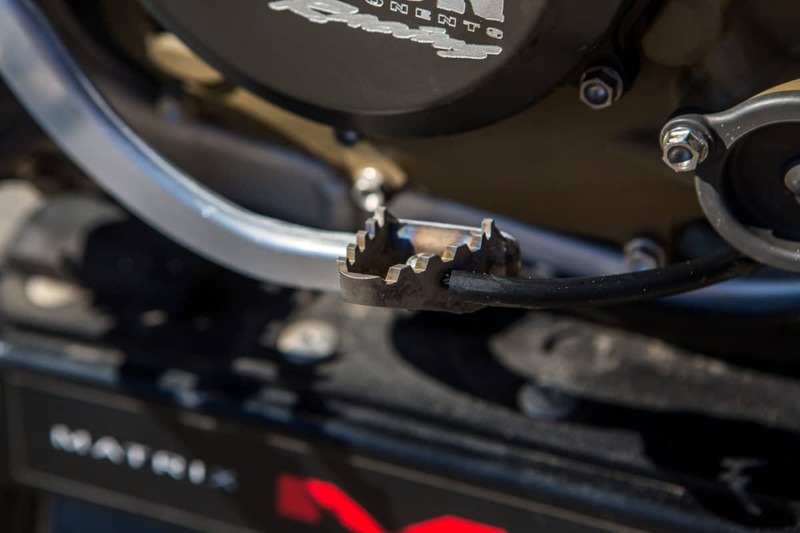 The brake lines are stock and Cycra provides the protection cover against debris. On the handlebars a works master cylinder is also added to the braking department. RJ does run a stock front axel but has other material options if he wants them. 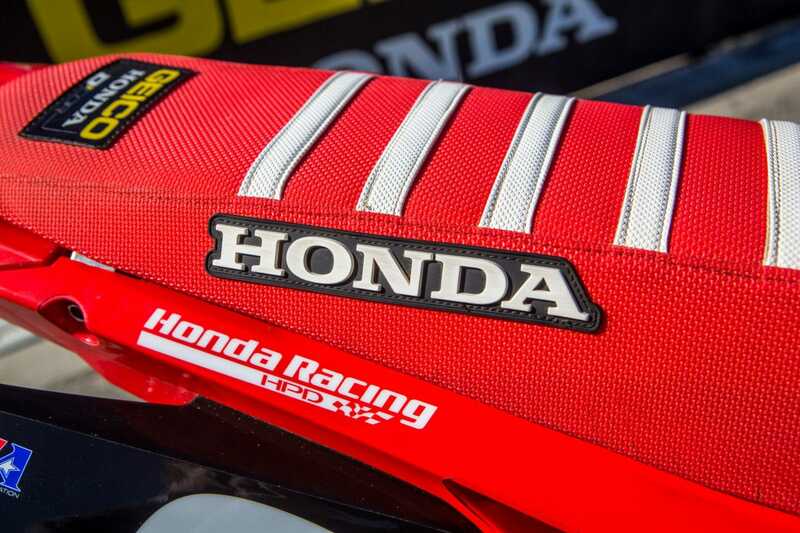 For this weekend (Daytona) and most outdoors, the team will run a mesh cover over the radiators to keep sand or rocks getting stuck in the fins and damaging the part. The team runs a high pressure cap on the radiators as well.Believe it or not the radiators are stock. RJ runs a 165 on the hole shot device. 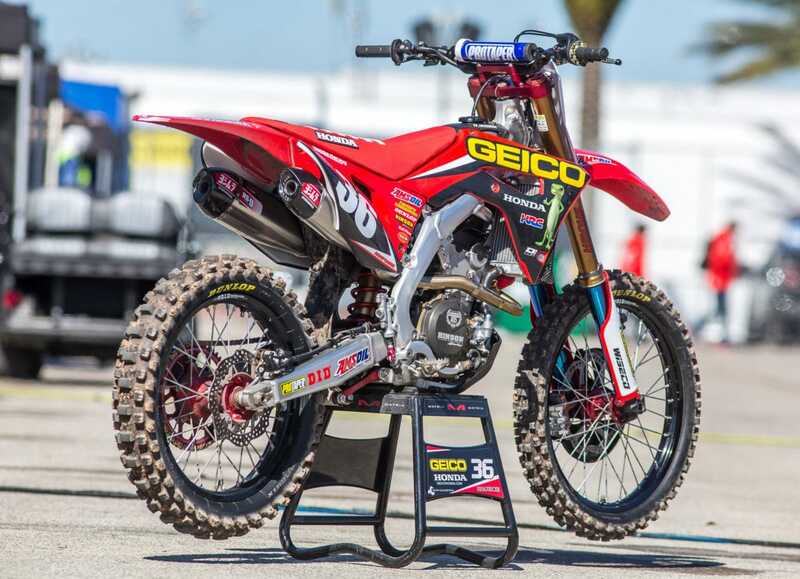 It is a lower position than they have run in the past due to the start gate changes Supercross made this season. 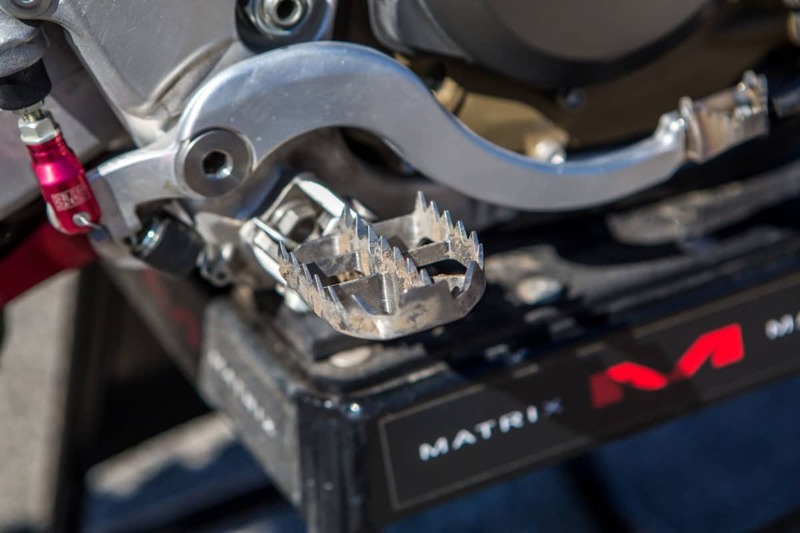 The team has options to run different fork guards that allow for a lower or higher position on the hole shot device. It all depends on track conditions if they will make a change. 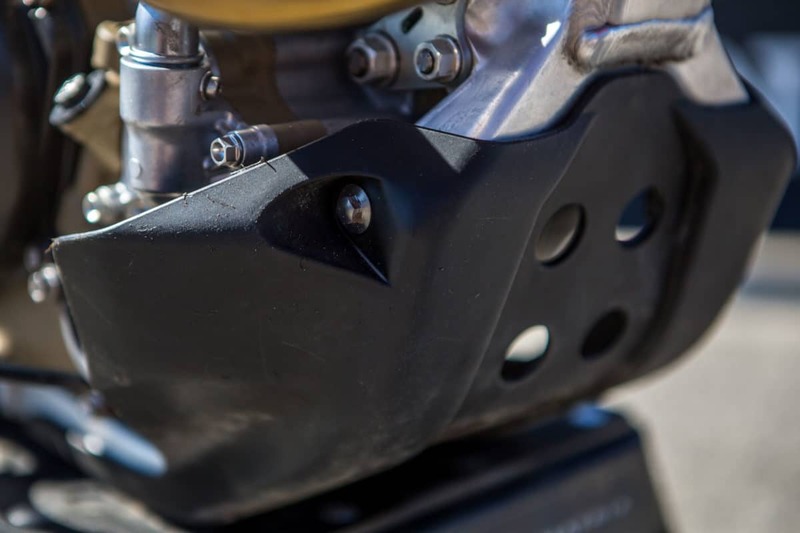 A stock skid plate protects the under belly of RJ’s motorcycle which includes wings that add more protection to the sides of the cases. The motors are done in house at Factory Connection in Southern California. The package starts with the team at a base and then the riders can make changes to mapping to better suit their needs. 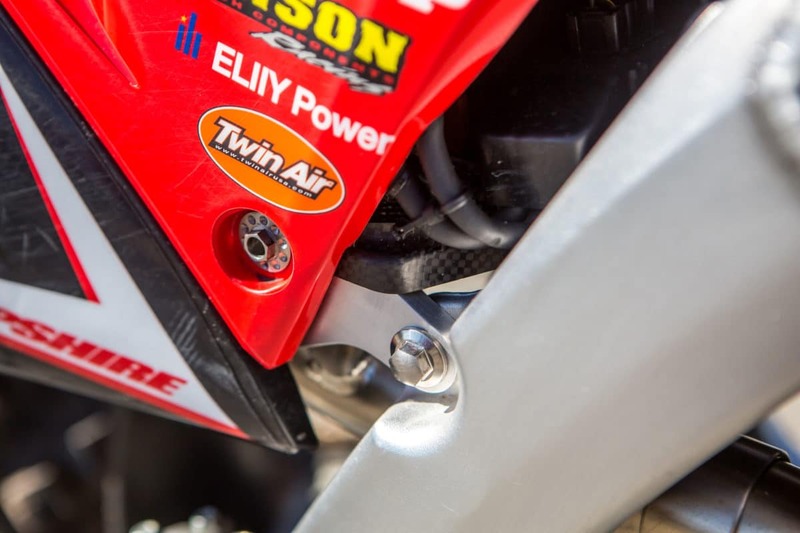 The swing arm pivot is stock along with the cases along with the hoses FC uses. The cases are sent off and coated to add to the factory bling. This also adds some durability to the cases. 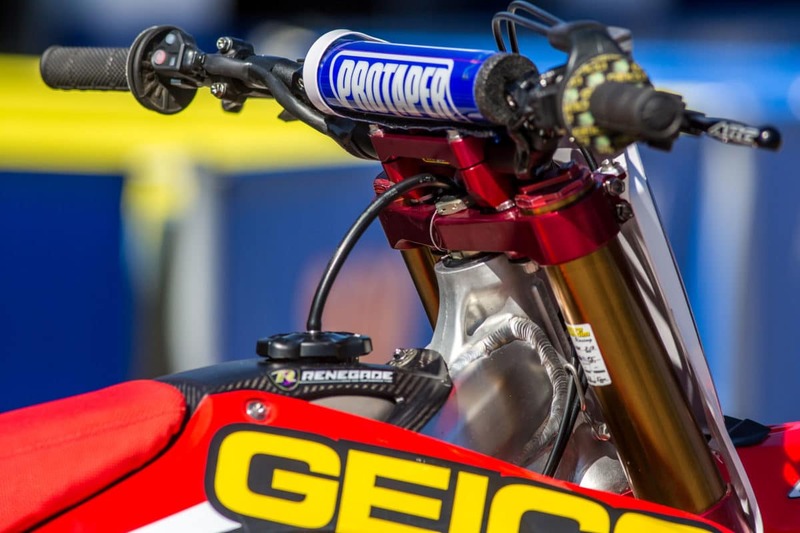 Rj’s shift lever is another works component. 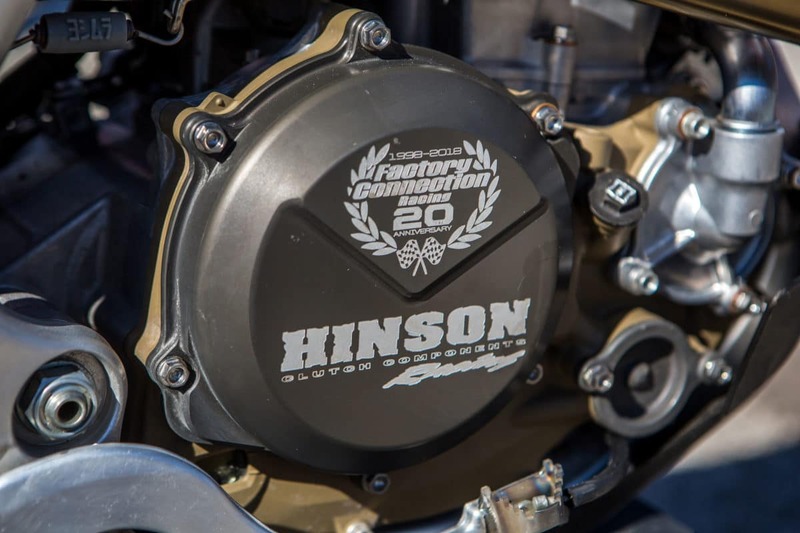 Hinson works with the entire Factory connection team. 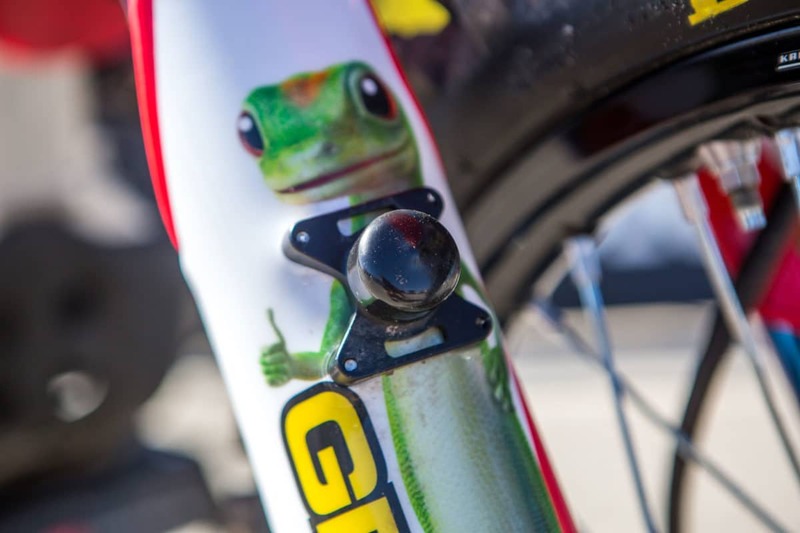 They offer several options for the riders to choose from. RJ runs a middle of the road style clutch with nothing to crazy when it comes to engagement or pull. Normally you will see a wire component or what they call an O2 bung on the top of the header. 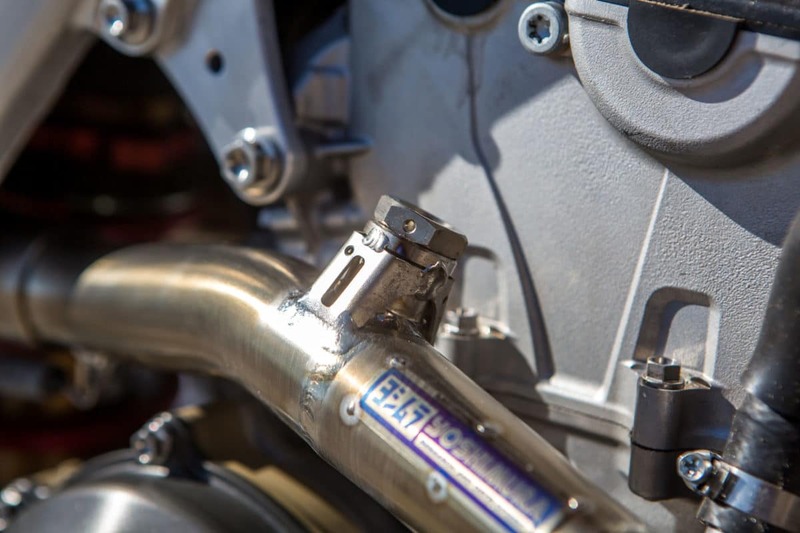 When the 02 bung is connected the team is currently running data on the motorcycle. This piece was off the bike for press but we are sure it’ll be on during race conditions in Daytona. 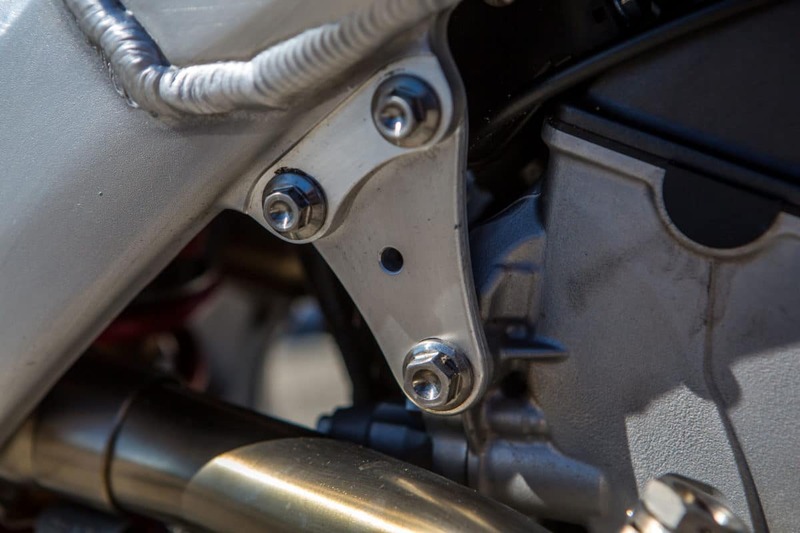 A piece that always differs in design on the factory bikes are the engine hangars. For RJ, the hangars are actually a stock component with a drilled hole in the center. This is to slightly change the flex characteristics of the bike. Works foot pegs and mount are attached to the bike. There are no offsets or change in position from stock. Another works part is the brake pedal and tip. A carbon fiber starter relay bracket is added to the bike. It re-positions it, saves weight, and increases the overall durability. 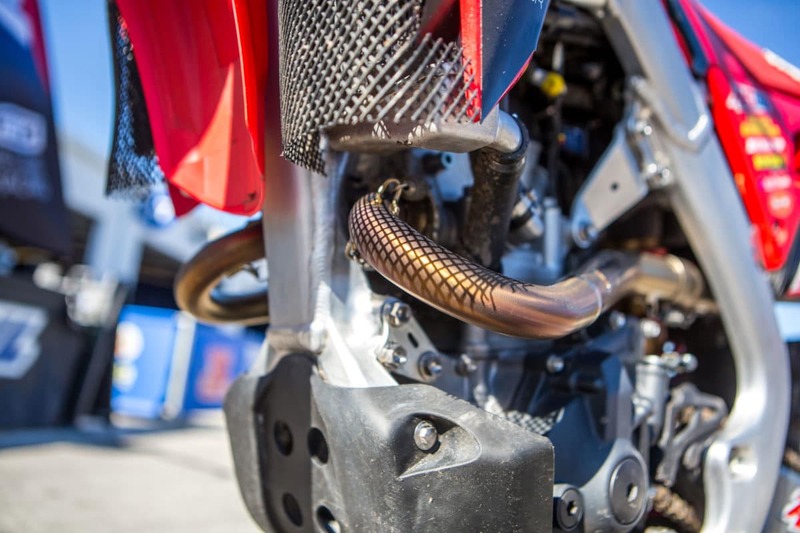 Yoshimura dual exhaust is mounted to the rear of the bike. 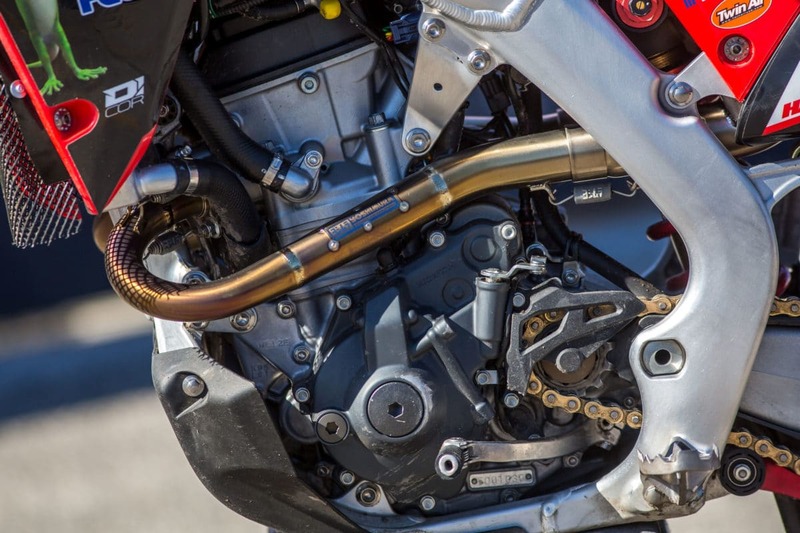 Yoshimura also provides the brake clevace. On the rear a titanium axel is added. The block themselves are stock with a ano-coating on them. 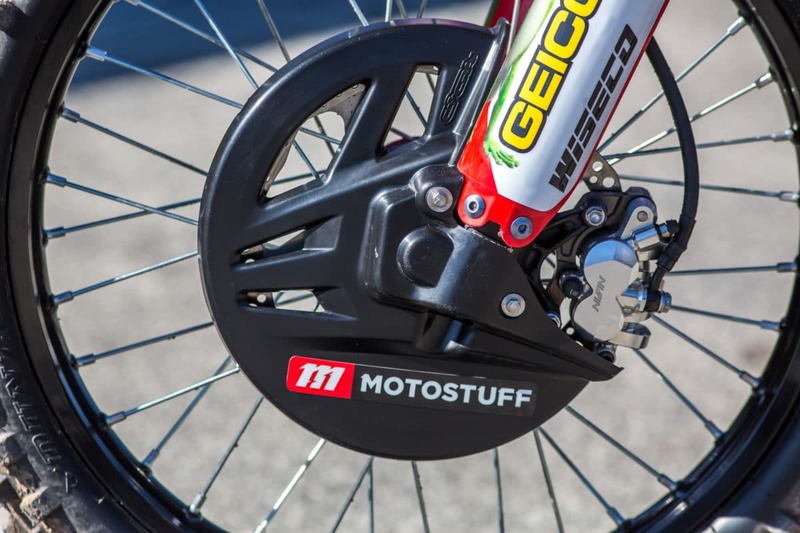 The rear rotor is by Motostuff and turned down. The entire bike is littered with titanium, aluminum, and steel. The aluminum pieces are on parts that don’t take a heavy load or have a chance of being damaged. 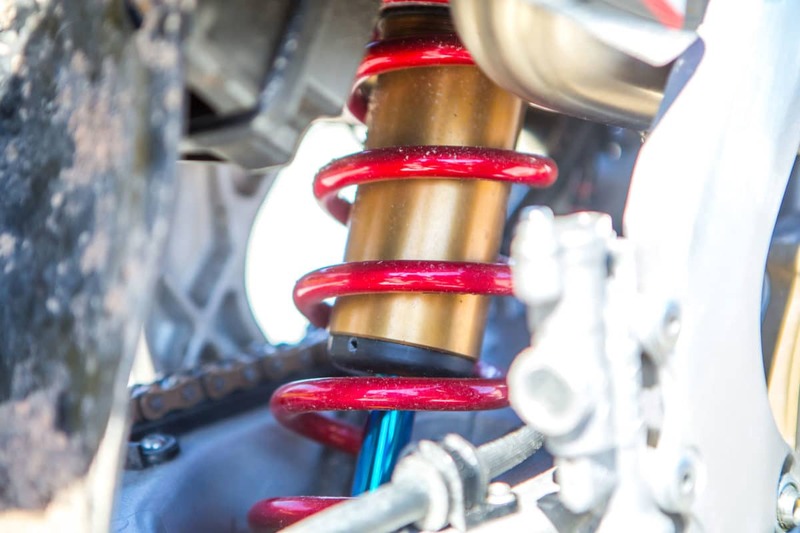 The rear shock is Showa. It is a Factory Connection Delta linkage set up. Hampshire and Martin run two different set of forks. While RJ is on Showa spring and Martin is on KYB air. Wheel position is based on gearing options. There isn’t too much you can do with wheel position unless the rider requests something different. At that point they will have to look at gearing options to compliment the new position. This changes from week to week as track conditions differ across the series. D’Cor handles the seat cover and overall graphics layout. 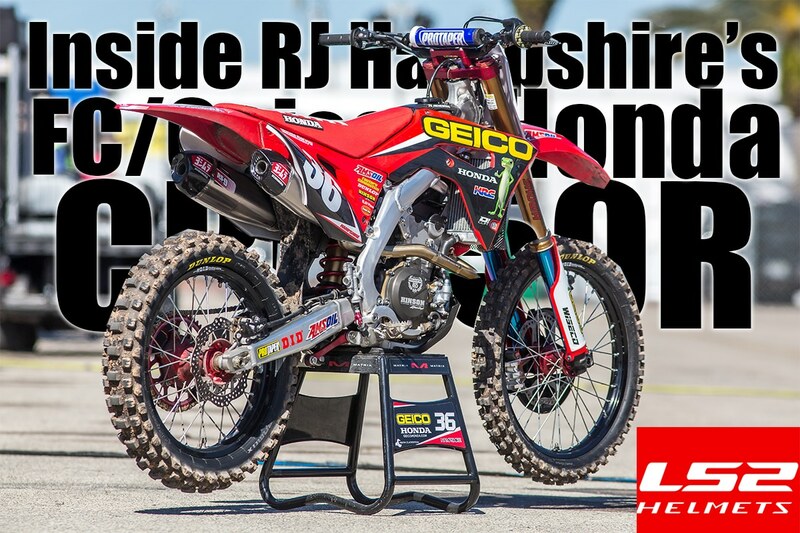 The 6 added ribbs on the seat cover keep RJ in position off the start or when seat bouncing in sections. The stock harness and wires are repositioned on the bike. Any sharp edges or things that could get damaged are looked at to avoid any damage. Quite a bit of components have rubber booties on them for that very reason. 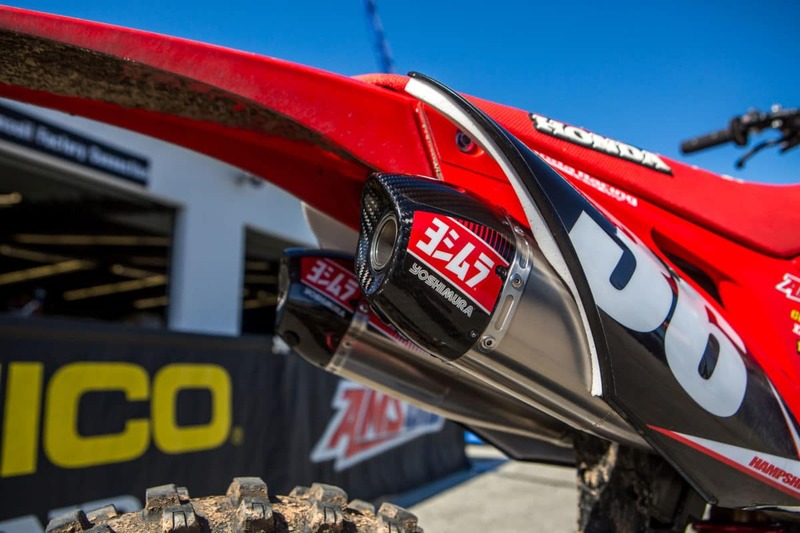 Another look at the dual exhaust of Rj’s Honda CRF250R . 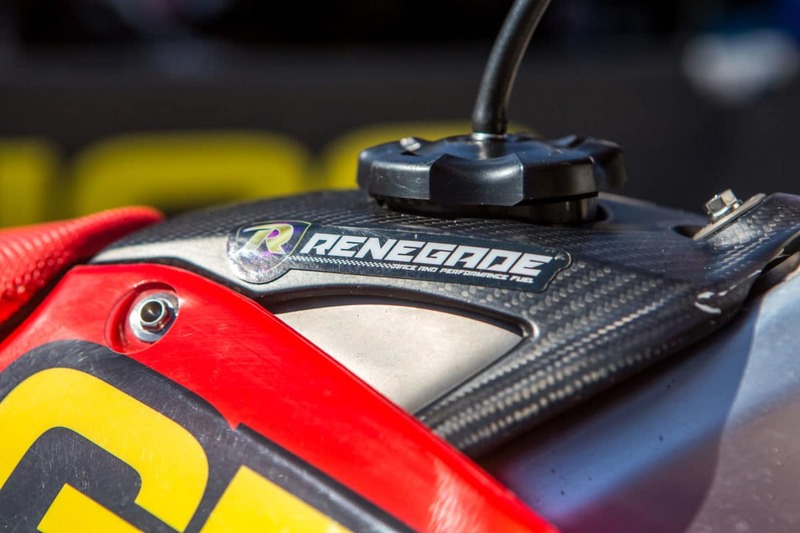 A carbon protective piece is added to the aluminum gas tank and inside that tank is Renegade fuels. A small site glass is added to the bike. 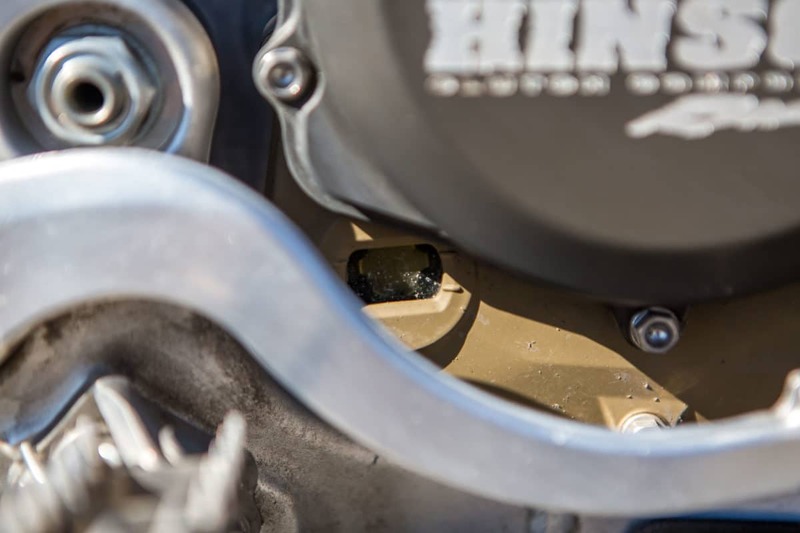 There is actually a site glass on the master cylinder as well. 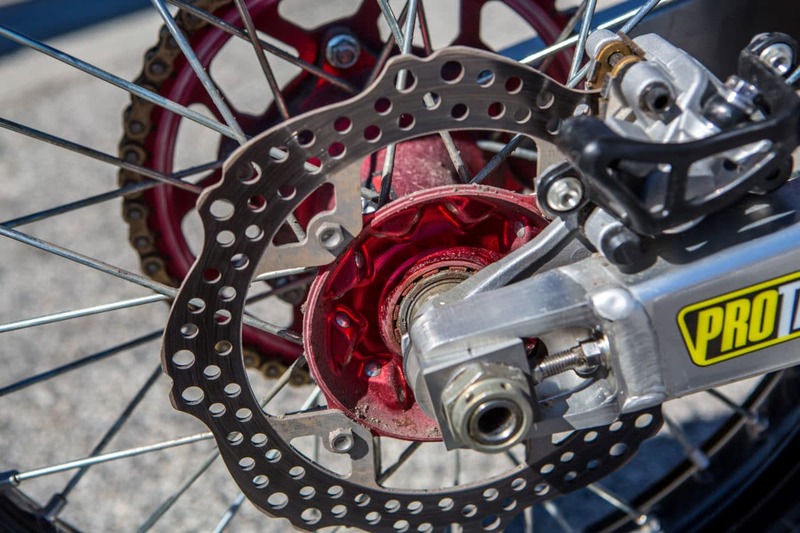 Most factory bikes are running no site glass on the rear brake system in case of a rock hitting it and the brake failing. 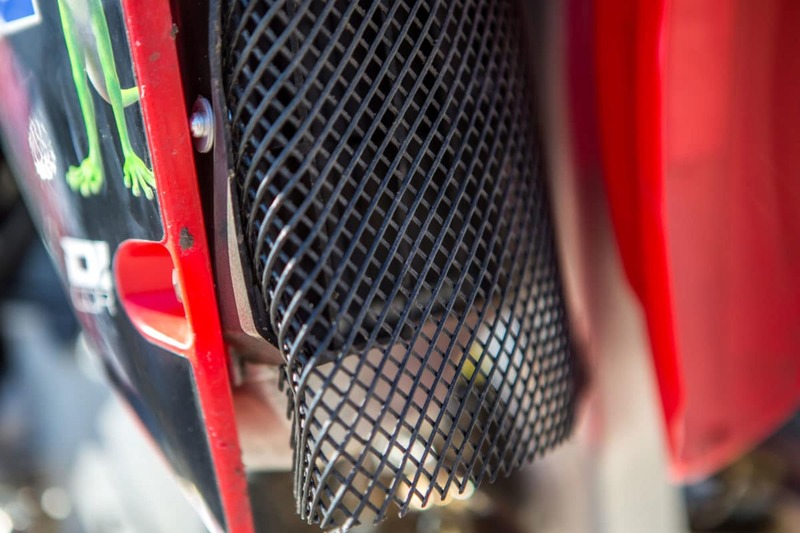 A Twin Air filter sits inside the air box with screen for Daytona. RJ has options for a mud filter, sand, and regular style filter as track conditions change.